Most good cooks never write down their recipes, even when pestered to do so. They say things like "I never make it the same way twice," or "I cook by intuition, not recipes." And while this is true, most cooks welcome an extra pair of hands in the kitchen. Should those hands come with a notebook and camera, even better. Veneda is an excellent British cook. I have dined on countless superb meals at her well-laid table: Pork Roast and Red Cabbage; Steak and Ale Pie; Shepherds Pie; Lamb Cutlets and Roast Potatoes; Chicken Tarragon; Fish Pie; Apple/Blueberry Crumble; English Trifle; Bread and Butter Pudding. Of all her home cooked meals though, her beef stew with herb dumplings is my favourite. After asking for her recipe for years, one wintery Saturday afternoon, I invited myself around to share in the preparation. Four hours later, we were feasting on this fragrant, comforting, happy-belly meal. Heat 4 tbs of oil over medium heat in large pot. While oil is warming up, trim fat and sinew from beef. Cut meat into chunks, roughly 2” x 2”. Raise heat under pot to highest level. Toss in the beef. Brown on all sides, constantly stirring with large wooden spoon. This takes about 10 minutes. Peel and thinly slice onions. Add remaining oil to same pot used to brown beef. Stirring often, caramelize onions over medium heat. This takes about 15 minutes. While onions are cooking peel shallots. Peel and slice carrots. Peel and chop swede. Set aside. When onions are nicely browned, transfer to beef pot. Add two tablespoons of oil to freshly emptied cooking pot and brown shallots, carrots and swede over medium heat, stirring often. This takes about 10 minutes. While vegetables are browning, peel garlic cloves and add to beef pot, along with tomatoes, beer, half the chicken stock, salt, pepper. Blend thoroughly. Add shallots, carrots and swede, along with thyme and bay leaves. Cover and place in hot oven for 30 minutes. While stew is cooking, clean mushrooms and slice in half. After half an hour, lower heat to 150c 300F add mushrooms, blend well, cover, and continue cooking for another 3 hours. 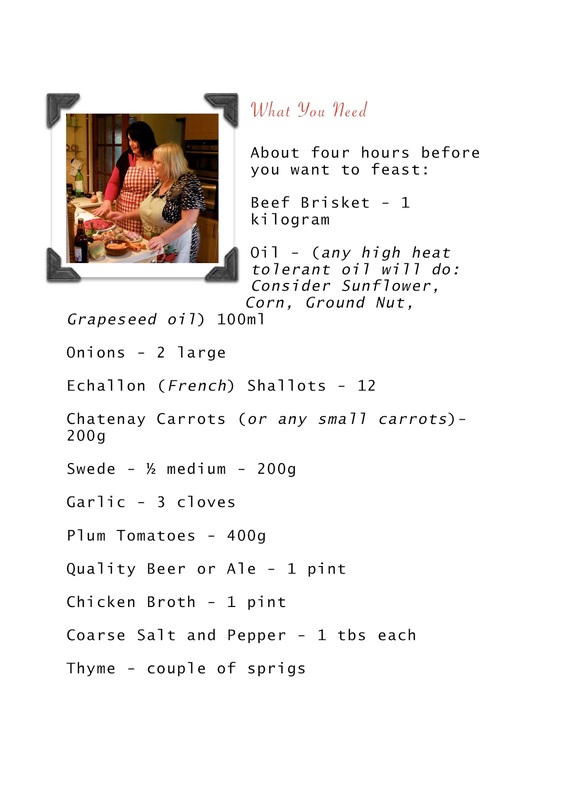 Check stew every hour, adding reserved chicken stock as needed. The last hour of cooking make dumplings: In a medium bowl combine suet with flour, herbs, salt, and cold water. Blend thoroughly with hands. Add a little more water if too crumbly. Dough should be the consistency of good pizza dough, slightly firm and easy to handle. Form dough into 12 balls, roughly the same size. Add dough balls to the top of stew the last half hour of cooking. Push dumplings down into broth, so that they are half submerged. Firmly replace lid and continue cooking for another half an hour. Serve immediately on it’s own, or with a side of mashed potatoes. Makes plenty for six hearty eaters. 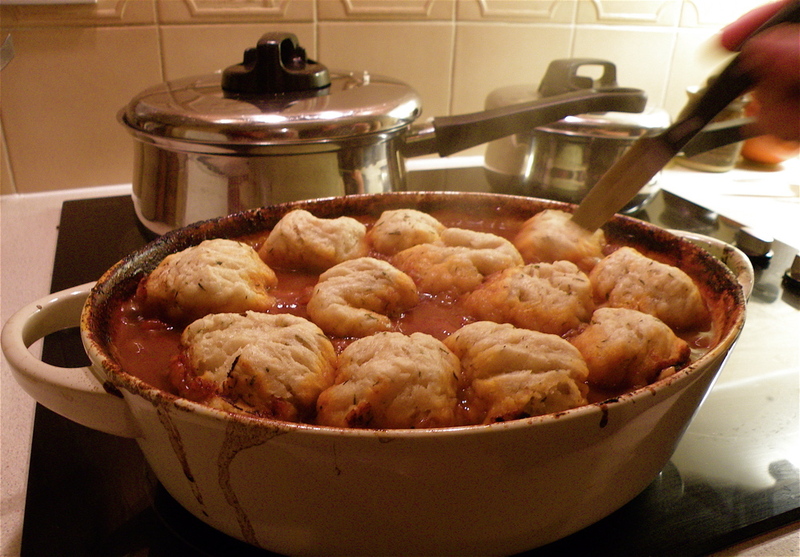 Veneda's Beef Stew and Dumplings hot out of the oven. For desert, Veneda and I agree, a cheese board, or cheesecake, is the perfect conclusion to our beefy dinner. My favorurite cheese board is made up of good English Cheddar, Camembert and Parmigiana Reggiano, served with grapes, apple, pear and very thin, rough oatcakes (for Yanks, this is not a cake at all, but what we call a cracker) By all means, include a nice glass of port with your offering. If you are fortunate enough to have leftovers, the stew makes an excellent beef and ale pie. Top with fresh made dumplings or mash. Large, shallow frying pan, good pair of tongs and paper towels. In a medium bowl combine buttermilk or yoghurt with salt, pepper and cayenne powder. Set aside. In large, shallow bowl, pour out 4 cups malt flour. Set aside. Peel and thinly slice onion. Separate into rings. Set aside. Pour half the oil in large frying pan. Heat over medium heat. While oil is heating, dredge onion rings in seasoned buttermilk, working with - 8 rings at a time. Then, roll in malt flour, thoroughly coating. Working in small batches, place coated onion rings in hot oil and shallow fry until dark and crispy, about 4 minutes on each side. With tongs, transfer onion rings to paper towel lined platter, or unlined heatproof plate, for keeping warm at low heat in oven. Repeat process until you run out of onions, buttermilk or flour. Replenish/Refresh oil as required. Serve hot on it's own, or with your choice of dips. Buttermilk or Blue cheese dips are good, though I like them best unadorned, as an appetizer to a beefy meal. Enjoy with a fine ale, bitter, cider, or lager.